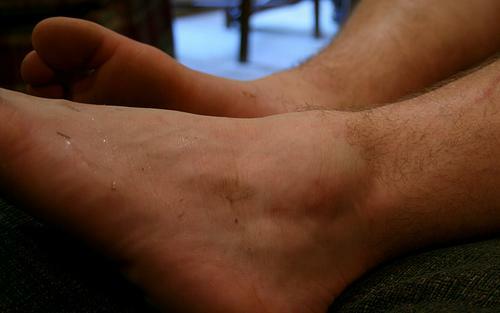 There can be many reasons why you have a swollen ankle with no pain. Some are easily explained, especially if you have been walking or standing on your feet a lot. The problem begins if your ankles remain swollen as this could be a sign of something more serious. Consult your doctor if you experience severe symptoms or persistent duration. What Can Cause Swollen Ankle No Pain? When you are active it helps the blood flow to leave the legs and go towards the heart. If you sit for long periods of time, you may experience the effects of blood pooling at the bottom of your legs. This can lead to the fluid leaking into the soft tissues of the leg and a swollen ankle with no pain, which is also called peripheral edema. The easy way to resolve this is to get up periodically and walk around. People with excessive weight mass are at higher risks of experiencing swollen ankles with no pain. Just as with being inactive, the veins in the legs and abdomen are compressed and you will end up with increased pressure in the veins of the leg along with blood pooling. You will notice a difference fairly quickly just by dropping a few pounds and walking regularly. If you have moderate to severe issues with your heart, you may experience swollen ankles (no pain). This is caused by the inability of the heart to properly pump your blood. This condition also results in water being retained by the kidneys and edema of the feet, lower legs, and ankles. Your kidneys are responsible for keeping the balance of water and salt in your body on an even keel. When you develop kidney problems,the salt and water levels are out of proportion inside your body. This will cause your body to retain abnormal amounts of fluids. If you have kidney troubles, you should refrain from using salt to reduce any water retention problems. Short bouts of swollen ankle no pain are often reported by pregnant women. Generally, you don't need to concern, but if it becomes consistent or excessive keep an eye on it – it could signal pre-eclampsia, causing high blood pressure and protein in the urine. If your swollen ankles are associatedwith headaches, nausea, vomiting, abdominal pain, vision changes and infrequent urination you should contact your physician right away. If you have trouble with your lymph nodes or have had them removed you may experience a buildup of fluids. The lymph fluids are full of protein and move along your capillaries and blood vessels, which functions to detect and destroy bacteria and any other harmful substances. If you have problems with your lymphatic system, it can block the movement of the fluids and lead to infections.If you have had your lymph nodes removed and have swollen ankles, make sure you contact your doctor immediately. Your monthly period – some women retain fluids around the time of their menstrual cycle so it would be relative normal to have swollen ankles around this time among women. Getting older – as people's ages increase, regular activity they engage in decreases, therefore, the circulation to the heart slows down and the fluid retention may develop. Foot or ankle injuries – if you sprained your ankle or hurt your foot you might experience some swelling around the injury. Consuming too much alcohol may cause swollen ankles. Here is an online symptom checker that may help you identify the causes from Mayo Clinic. Taking magnesium supplements relieves and prevents swollen ankle (no pain). The recommended dose is 200mg two times a day. If you are pregnant, consult your doctor for the right dosage. Yoga is a non-impact exercise that consists of holding different poses and stretches. It helps to improve your circulation and eliminate edema in your ankles. You can rest your feet in a bath that is filled with tonic water or salt water. The quinine from the tonic water helps to bring down the swelling. Adding Epsom salts to your foot bath will not only reduce the swelling but relax the muscles in your feet and legs. Adding a few drops of grapefruit oil to your foot bath will provide a refreshing touch. If you want to skip the bath you can mix up some grapefruit essential oil with olive or almond oil and rub it into your legs and feet. This will ease your aching muscles and increase your circulation, thus eliminating swelling around the ankles. Call for a massage therapist to get a professional massage. Stimulating these areas will speed up the circulation to the heart, especially if you are unable to get out and exercise. Many people who find themselves with tired feet can prop up their feet to relax. If you find any swelling but no pain around your ankles, elevate your feet for some instant relief. If you have access to a swimming pool, you can swim a lap or even just float in the water to help ease the swelling in your ankles and get your circulation moving again. Drinking water will help to reduce excess salt in your body. If you drink up to 10 glasses a day to help flush out the extra sodium. You can improve the taste and functions by adding some lemon and cucumber slices to your water.